Exit I-88 at the Lake Street (Route 31) exit. Turn right at the light and travel approximately 2.5 miles to the downtown Aurora area. Turn west onto New York Street (east of Route 59, this road is known as Aurora Avenue). Travel approximately 6.5 miles to the downtown Aurora area. Turn east onto Galena Boulevard (Not Galena Road). Travel approximately 7 miles to the downtown Aurora area. Route 31 begins at Route 34 in Oswego and heads north. Turn onto Route 31 and travel approximately 6 miles to the downtown Aurora area. Exit Route 30 at the Lake Street (Route 31) exit. Turn left at the light and travel approximately 3 miles to the downtown Aurora area. 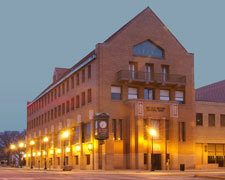 111 West Downer Place is located within the Old Second Bank Building at the corner of River Street and Downer Place in downtown Aurora. Enter the building through the revolving door adjacent to the parking lot, which is north of the building. Walk through the lobby to the other side of the building, closest to Downer Place, and take the elevator to the third floor. We are located in Suite 312. Parking is available on Downer Place as well as most other streets. In addition, parking is available in the Old Second National Bank’s parking lot north of the building.